Make, fix, create, and assist others in learning lifewise. "We mass-produced our stuff and made it cheap so we could afford lots of it, and thus the quality had diminished to the point that we needed even more stuff, because cheap things break or go bad or get old fast. Things that grow more valuable with age are typically things of superior quality. Even now we might be unable to recognize things of superlative quality, and if so, it was already too late--we'd have to wait four hundred years for a second Renaissance to flood the culture with light." Shall we wait four hundred years? The light that flooded the renaissance culture was the transformation of self that comes when folks are creatively engaged in the making of useful beauty. The ease with which we accumulate massive amounts of meaningless stuff will not suffice and we pay a large price. The value of hand crafted beautiful objects is not only in the things themselves, but also in the character, skill and intelligence of the maker. We stop making and the culture suffers. This is yards and yards of yard sales weekend in Eureka. It is a time when folks bring out the stuff that no longer matters to them and that's clogging up their lives. It can be bought cheap by others, hauled away (some folks brought trailers) and clog their lives instead. The piece in the photo above is some of my early work from around 1980 or so. 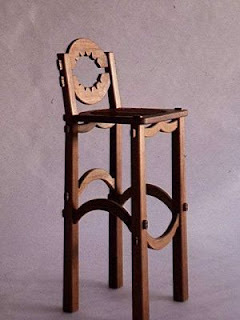 It is made of cherry with exposed mortise and tenon joints locked and expanded outside the mortise with walnut wedges. I don't know if this piece of early work exists or if it has value. It served me at the time as a means to explore my own creativity and craftsmanship, values I attempt to hold to this day. Make, fix, create, and put others in motion learning lifewise. Yesterday at ESSA I finished installing a router lift in one of the router tables. 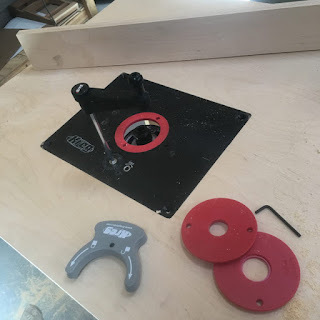 The router lift makes changing bits and adjusting router height easy, and most woodworking schools have them, though I've never felt the necessity of having one in my own shop. At Clear Spring School I started my students making boxes. Boxes? they asked. Yes, boxes, I replied. They come into the shop with all kinds of things they want to make. The important thing is that they develop skill and are thereby empowered to do whatever they want. They're not there yet. I made things easier for them by milling and cutting the material to size. There were plenty of difficulties to be found in bent nails, wayward nails sticking out in the wrong places, and misaligned parts. There was also the challenge of listening and following instructions. 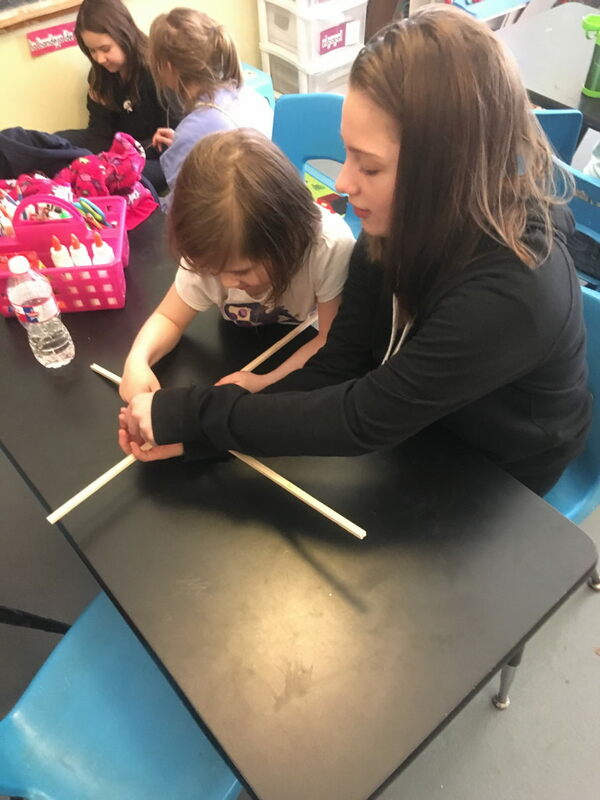 I learned that making of wooden skates on Wednesday led to some after school speculation, with at least one student wondering how to solve the problems with her skates. Most of the speculation involved how to better attach the skates to feet. Getting a student to wonder how to do things and how to improve things, even outside of wood shop is one of the objectives. We want children to observe closely all that surrounds them. Today in the Clear Spring School wood shop, I'll help my middle school students work on a dragon puppet for the upcoming May Fine Arts Festival parade, and offer further assistance if needed on their hydroponic window garden. At the Eureka Springs School of the Arts wood shop, I've been installing a router lift in a router table. This is part of my effort to ready the wood shop for summer classes, and the router lift allows the user to raise and lower the router in precise increments without climbing under the table to do so. 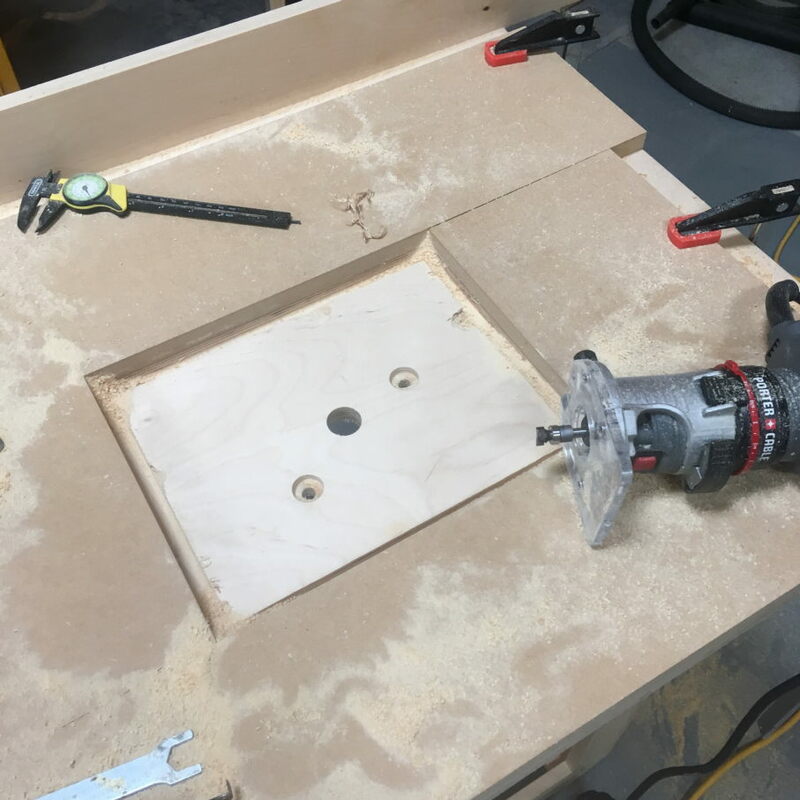 The process requires building a temporary frame around the router table lift base (while it is upside down on the router table) then removing it and using a template following router bit to exactly form the shape of the base routed to a depth equal to its thickness. After the temporary form is removed and the center is cut out using a scroll saw to cut along the inner line, the router table lift base will fit flush. Again, you see that words are insufficient when telling how to do something. A picture is required, and even that may not be enough. But if you were standing with me, you could ask questions, or even try it yourself. This is a simple and useful technique but one that not all woodworkers are familiar with. Yesterday, the first, second and third grade students at the Clear Spring School reminded me that they wanted to make roller skates. 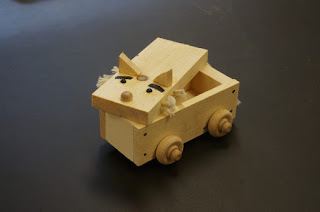 Of course wooden wheeled skates are not the best as far as strength and longevity are concerned, but they figured they could make them the same way they make toy cars. Then came the discussion about how to attach them to feet. Would scotch tape work? Perhaps duct tape would be required. I suggested they hot melt glue the skates directly to their shoes. They all laughed and told me what a crazy idea that was. But after fooling with tape and strings, they decided hot melt glue was not so crazy after all. Some tried it. In case anyone wonders about the value of such things, Project Zero at Harvard calls it "studio thinking." At MIT they call it tinkering, and it is important that children at all ages are engaged in it. I went back to school later to check that the skates would indeed come off the shoes when skating was done and before the students left for the day. Fortunately the glue did not provide permanent attachment, so I was relieved to find I was not in as much trouble with parents as I might have been. I have some cloth Shaker tape, which with velcro applied to each end, may provide a better solution. We will try that later in the week. We will drill a large hole through the body of the skate, pass the canvas strap through and cinch them up. Visiting their classroom, I noticed that some of their skates were already broken or missing wheels, so some repair will be needed. DEspite my warning, some of the students had insisted their wheels would stay on without being glued. When you've made something yourself, you can fix it, right? One of the things I keep available in the wood shop are scraps. The kids come up with small pieces of wood that they've drawn upon, and ask, "will your cut cut this for me, please?" I ask them to draw what they want on the edge so I'll not waste so much wood, and I'll remind them that they will need to be patient. I can only help one student at a time. That's why it has become so helpful to me that the kids can make their own wheels. They work in pairs, with one locking the wheel securely in the vise while the other operates the drill press. And at this point, they can make wheels without my help. If anyone my age with an interest in woodworking wants to feel needed and wanted, volunteer time in a school wood shop. You will be rewarded. For making skates, the students knew that they needed 8 wheels for making two skates. Understanding that only 4 axles were required would come as they glued the wheels on the boards, as one axle serves two wheels. If things go as they usually do, other students will want to make skates, too. Make, fix, create, and increase the likelihood that others learn lifewise. We know that the most natural inclination for children is to learn through active engagement in all that surrounds them. They see what interests them and the next impulse is to touch, and explore. And yet, when it comes to American classrooms too many students are required to put all at arms length. Classrooms have become sterile and disengaging as though the child's senses do not matter, and we thus fail to utilize our children's most natural inclinations. No wonder American education is more expensive and less effective than in many other nations. Kindergarten was truly a revolution in early childhood education, with classrooms designed to inspire, and objects designed to systematically incite curiosity and touch. 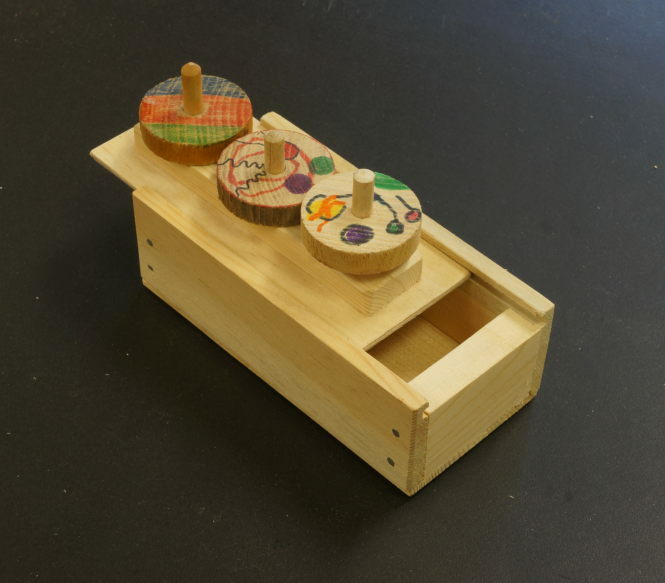 Inspired by Froebel's Kindergarten, Educational Sloyd was devised by Uno Cygnaeus in Finland, and promoted throughout the world by Otto Salomon to extend that revolution of sensory engagement in learning throughout the upper grades of education. We think of wood shop in school as being a means to direct children into mind numbing industrial occupation, whereas Educational Sloyd was intended to propel children into life as intelligent, responsible citizens with their natural curiosity and propensity for learning intact. When I went to Sweden for a Sloyd conference in 2006, one of my objectives was to visit Nääs, the school established by Otto Salomon to promote Educational Sloyd. I wanted to get fully immersed in a system of education that clearly recognized the relationship between the hands and learning, the use of the hands and the development of intellect. And what I found, like a shade lifting from my eyes, was so much more than I had allowed myself to expect. Sloyd, I discovered was not just the making of objects for the development of skill, but a complete foundation for a better way of addressing the overall educational needs of children. 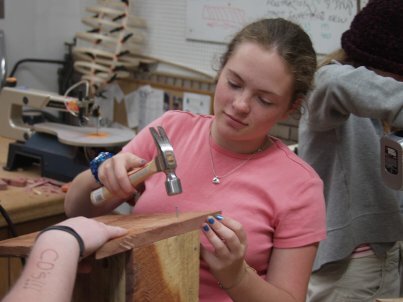 When teachers from around the world arrived at Nääs for summer classes, it was not just to learn how to teach woodworking, but to learn a complete theory of learning that encompassed and advanced the needs of the whole child. When I arrived, I was surprised to learn that gymnastics was also a part of Sloyd, that Salomon lectured each day on educational theory (in four languages), and that the Sloyd movement was closely connected to the Kindergarten movement which was at that time taking the world by storm in the lowest grades. In other words, Educational Sloyd represented nearly all that we have come to systematically neglect in American education. There are matters we can take into our own hands, and there is compelling evidence that we must do so. I cannot spell all this out in a single blog post, but I hope you will continue reading and test what you've read here in your own hands. Yesterday we had a minor catastrophe in the middle school class as I was attempting to help with their hydroponic window garden. As the upper manifold filled with water from the pump, it broke free from the hooks holding it to the top of the window. Parts, and water flew. Don't we learn better when things do not go according to script and when the realities of life enter into the fabric of education? Make, fix, create, and help others understand the value of learning lifewise. 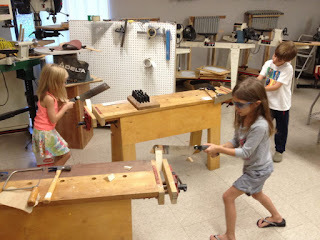 One of the absolute keys in keeping children safe in the wood shop is to train them in the use of the vise. We think of kids being either left or right handed, but they actually use both in most tasks. One hand is typically used to hold the tool, and the other the work. In writing, the dominant hand holds the pen, and the other steadies the paper, and if you want to test this, take a pen and paper and try things for yourself. What you will discover is that one hand works best with the collaboration of its mate. The non-dominant hand is the one that is typically injured as tools slip. The vise is not to relieve the non-dominant hand from its work, but just to keep it safe from being hammered, sawn or sliced with chisel or knife. It is also useful in most cases to have a third hand, which a vise or clamp can provide. Woodworking as my publishers are careful to point out at the beginning of my books, holds inherent risks. Those risks are minimized by the proper use of tools, and some way to hold wood safely and securely as it is worked. At Clear Spring School we have a room full of benches with vises sized for both child and adult use. The vises are objects of fascination. Every classroom should be equipped with a work bench with a vise or two, and at one time many elementary school classrooms were so equipped with the recognition that kids need to be doing real things. Today in the wood shop at Clear Spring School I will help our middle school students work on their hydroponic gardening window farm. They have been collecting bottles of a particular size. 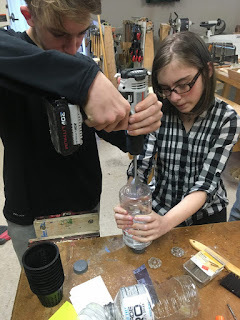 We have been drilling holes for them to fit together, cutting out sections for the planters to fit, and assembling them into long strings, following information both from online sources and from a hydroponic gardening store. It is an exercise in problem solving. At the local UU church yesterday, besides it being Earthday, it was my wife's and my day to supply snacks, do after service kitchen clean up, supply flowers, and offer a meditation during the service. With dogwood trees on our property blooming in abundance, the flowers were easy. For the meditation, I wanted to draw from my own experience with regard to Earthday. I attempted to juxtapose three things. On the first Earthday, 47 years ago, I stood with 5 or 6 friends in a field near Hastings College (in Nebraska) and shared words about how it had finally come to pass that folks were beginning to understand the importance of the environment. We shared a sense of hope, even though there were so few of us from campus at the event. Secondly, I noted that this is the one hundred and eleventh year of plastic. Plastic began with the invention of Bakelite, which was composed of formaldehyde, derived from wood alcohol, phenol derived from coal tar and wood flour, derived from wood. (They made other versions of the stuff using fillers of a more toxic variety.) Nowadays, plastic from even harsher petrochemical ingredients is everywhere and I noted that as I mopped the floor in the morning, the bucket was made of plastic, parts of the mop were made of plastic, cleaning supplies were in plastic bottles and plastic, everywhere in excess, is imposing a huge burden on all life and even enters the cells of our bodies. I noted that with plastics having had a fifty year head start, Earthday has a long ways to go to catch up. We need much larger numbers of people to recognize the needs of the planet. My third point was that in this month's Wooden Boat Magazine, it tells how to make your own wooden bucket. Would that not be a better alternative to the plastic ones we buy so cheap and that along with so much plastic crap causes undue burden on the earth and all life? In making our own buckets, the development of skill and integrity would take place.The effort would lead us out of the depression and anxiety that ail modern life. I finished with a poem by Langston Hughes, "In Time of Silver Rain." So what's a man (or woman) to do? We carry on and make the best of things. We attempt to remember those things that are most important. Make, fix, create and adjust your existence to learn lifewise. Yesterday I got a chance to work in my own shop, routing drawer guides in the sides of jewelry chests. The drawer guides consist of two parts. A 1/8 in. x 1/4 in. strip of wood is glued in grooves cut in the drawer sides, and grooves in the box sides are routed twice to be widened for the strips to slide within. The first routing is done between stops with a thin cereal box cardboard spacer between the work piece and fence. By removing the spacer for a second routing, the groove is widened just enough to allow smooth movement of the drawer in the groove. Is that something you can understand from words alone? Perhaps not. In all likelihood I might just as well be speaking French unless you are already a woodworker with extensive experience of your own. Even then the meaning of the words may escape you. Words are like that. They are generally insufficient, except when some prior experience is involved and even then may lead the reader astray.The routed grooves shown in the photo were but the first. 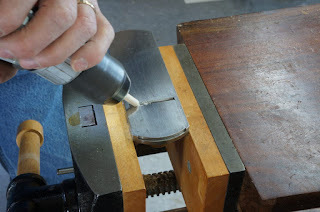 Each jewelry box side required 5 carefully routed grooves for the drawer guides to fit. The process required careful measurement and careful planning. This may help to explain why education based on language is not enough and why schools must provide various means through which students become usefully engaged in the real world. Otto Salomon, proponent of Educational Sloyd, said that the idea of a class of students was a challenging one in that students come into a classroom with varying degrees of experience in the subject, some knowing some things and some knowing others, but rarely on the same page with readiness for understanding the same information at the same time. What's known by one is not known by another. What's easy for one is not easy for another. What's simple to one is not to another, and What's concrete to one is not to another. Even student interest will vary from one student to another. This makes education much more of an art form than a routine process and it requires that the teacher's relationship to each student be strong enough that little stands in the way of learning. Make, fix, create and assist others in knowing the necessity of learning lifewise. 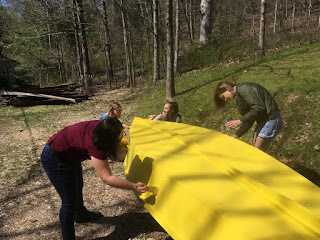 Yesterday my high school students applied more paint to our Bevins Skiffs, and my elementary school students ran with their kites until their strings were tangled in knots. Some of the kites will need new paper skins and to be rebuilt from the sticks up. Having exhausted themselves in play the students may not have energy for that. I'm hoping that we all learned a few things. Not everything can be put in words. We form catalogs of ideas from which solutions are drawn. If you've been engaged doing things in the real world, you may actually have a leg up in discerning the truth from that which is false. In multiple choice tests, one may be able to intuit the right answer by being able to recognize the answers that are discernibly false, so those who have been brought up in the real world, doing real things have an advantage that has been measured and proven by educational research. German Field Marshal Rommel was said to have fingerspitzengefuhl, which means knowledge even in his fingertips. It was said that he had an intimate grasp of the full field of battle in his head because his knowledge came from a deep engagement in real life. His advantage came from having both Wissenshaft (book knowledge) and Kentniss (knowledge derived from actual experience). And so it is on the latter side of things that modern education fails to produce effective learning. Early advocates of manual arts training insisted that taking time for manual arts refreshed the mind, making it more ready for books, whereas those who insisted schools were only for the basics of reading and writing, insisted there was no time for such luxurious things as music, the arts and woodshop. Turner http://wisdomofhands.blogspot.com/2012/10/land-grant-and-mechanic-arts.html was considered the father of the land grant college, and all the great, large state schools in the US are indebted to him for promoting the legislation that created them. Make, fix, create and increase the likelihood that others learn lifewise. This day promises to be lovely for painting boats, so first thing, I'll get the sanding blocks ready and paint stirred. A donor is supplying water testing kits that she will deliver to school today. Those will be used to test the water in local lakes. A question came up whether to use student labor in wood shop to do fundraising projects. In the past, we've made some things to sell and raise money for our travel school program. But we must not wander far from student interest, and student learning. To use the wood shop as a fund raising tool must be based on a strong expression of interest from the students and my fellow teachers. Otherwise I'm put in the position of task master, quality controller, and cajoler, while students drag feet and miss opportunities for more effective, joyful learning. If student interest is not present, learning will not be at full force. Joy is the measure. It's what you see when interest and learning are present in equal measure. We saw that on our first kite testing day. (see photo) We'll see it again today as our students return to the field with longer kite strings attached. Make, fix, and create... Insist that others gain the opportunity to learn lifewise. Yesterday during wood shop time, we attached tails to kites and short strings and took them to the field adjoining the school to give them a test flight. The kids loved the experience. Some ran with their kites until nearly worn out. We have some repair work to do on some of the kites. Torn paper must be either taped or replaced. Mainly, however, despite some abuse (one was stepped on), the kites held up to fly another day. The children will be asked to give some thought to how they performed and what changes they would make to improve flying performance. 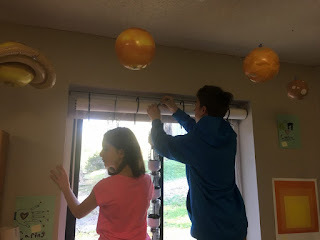 For the 4th, 5th and 6th grade students, this project started out with a teacher's proposal that students design their own kites and then evaluate why they did or did not work. We found that students may need concrete examples to get them started in the design process. Diesterwegg's precepts as described by Educational Sloyd were that you start with the known and then move toward the unknown, from the easy to the more difficult, from the simple to the complex and from the concrete to the abstract. Students will now have a better chance of designing their own kites, having started with easy, from the known, from the simple, and from the concrete. It is extremely difficult to start out designing something from the mind alone. The formula for success is easy, and was described by Otto Salomon in the Teacher's Guide to Educational Sloyd, much more than a hundred years ago. Who would suspect that education at large would learn anything at all from Manual Arts? But the manual arts suggest the way we all learn, and the way that education could best be planned. Make, fix, create, and adjust education so that all students learn lifewise. 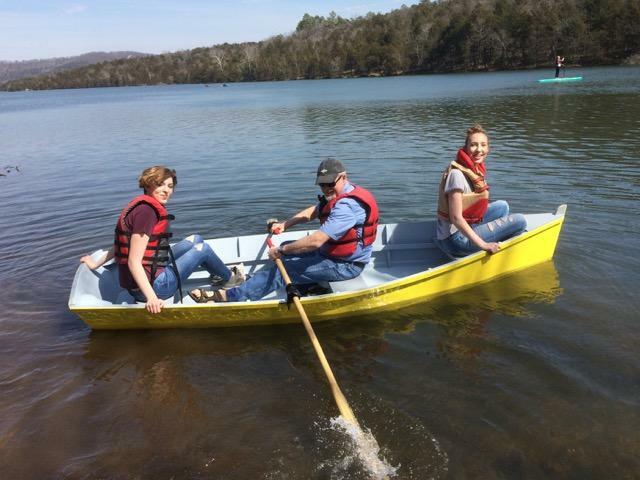 Yesterday Ozarks at Large on public radio station KUAF broadcast a news segment about the making and launch of our Bevins Skiffs. 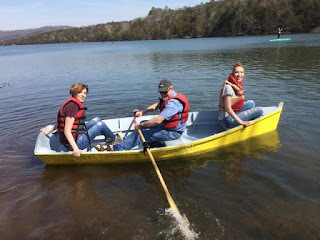 NPR editor Jacqueline Froelich visited the school as the boats were under construction. She interviewed some of our students and then attended on launch day for more interviews. As a dedicated reporter Jacquie brought her own Kayak to be on the water with the kids. The idea in building the boats is simply that we learn best by doing real things. If those real things can be planned to be of benefit to our communities, the students learn that they are important in the scheme of things. By doing diverse things, students discover their own skills and inclinations, as well as their hopes and are thereby led forward from within. 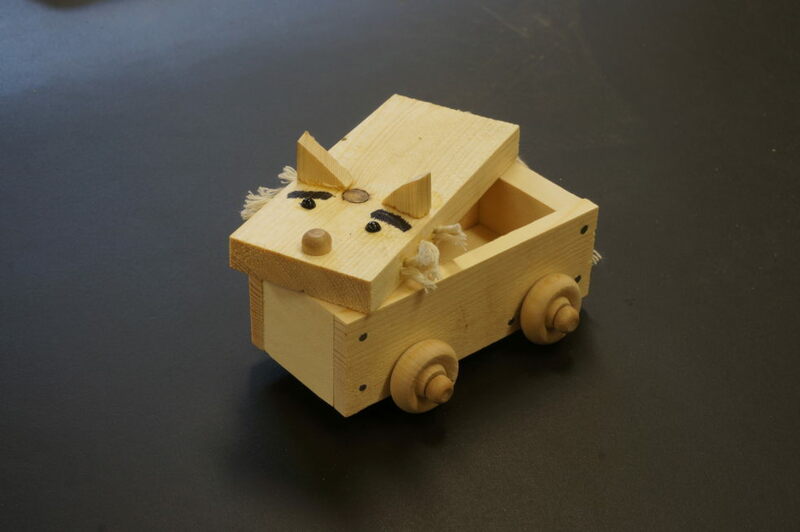 Today in the wood shop, my middle school students will be working on bird houses and my lower elementary school students will be making things from their own imaginations. We will be applying more paint to the Bevins skiffs on Friday. Make, fix, create and nourish the notion that others may learn likewise. Yesterday my high school students hammered copper into thin sheets, turned rings on the lathe, painted oversized scrabble squares, and did other things of their own creative inclination. Weather permitting, we will return to painting boats on Friday. All of my students love "free days" best when they are allowed to work on the things that come from their own imaginations. I prepare stock, provide tools, and watch over for safe use of both. In addition, my upper elementary school kids, with my help, added bow strings and bridle strings to their kites. I am concerned that as more and more learning is shifted from real life observation to flat screen, students are becoming less reliant on themselves, and more on externalized expertise. They ask, "Show me this." or "Do this for me." With the insistence, "I can't." And based on my conversations with educators at all levels (even college) this seems to have become the pattern in the digital age. An old man or woman can learn to read, do it quite well, and enjoy it, but it is more challenging to keep creativity and the willingness to experiment in tact beyond the Kindergarten years (originally ages 3-8). That should be the focus of learning in school. While planning for my Viking chest Class at ESSA in collaboration with Arkansas blacksmith Bob Patrick, I share the lovely image from the Cloisters, showing a painted chest with hand forged hardware. Make, fix and create, while assisting others to learn lifewise. I am documenting some of my projects at school in the hopes of sharing them with teachers, parents, and their children. 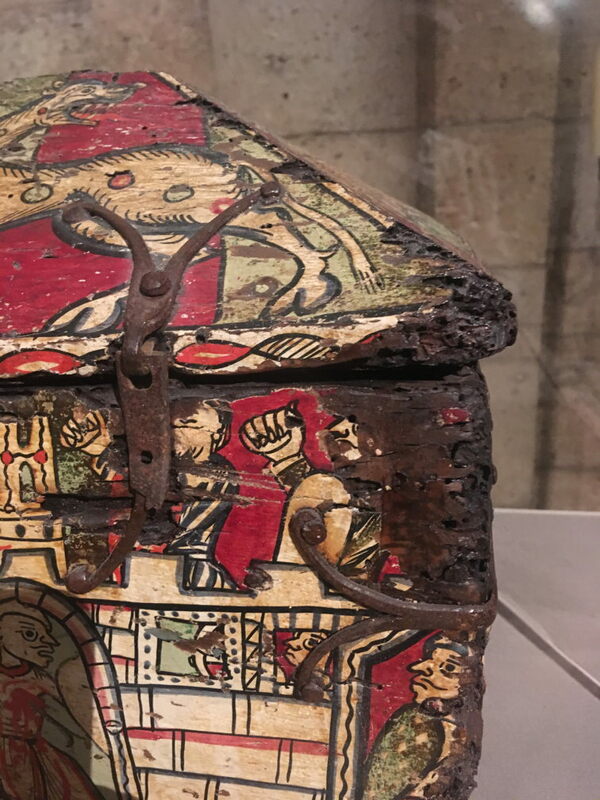 This box shown is a box to hold and display hand-made wooden tops. Today in the wood shop at Clear Spring School, my upper elementary school students will finish their kites. My high school students will continue working on independent projects and my lower elementary school students will continue working on toys and super heroes. Perhaps some will want to make a box. Children are hard wired to learn and evolution has fitted them with the powers to do so. That power is most efficiently and effectively mobilized through play. Parents and teachers have the duty to assist them in this enterprise. 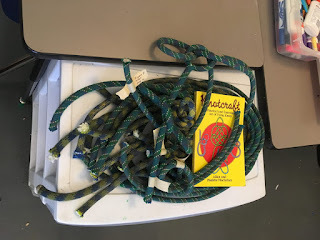 Our lower elementary school teacher at Clear Spring has prepared a lesson in knots for his students to follow using sections of large rope. Not only will this lesson help to develop hand/eye coordination, it will develop spatial sense, and impart a practical skill and greater confidence. Would you "knot" enjoy knowing a variety of knots and their best use? Many adults are puzzled when it comes to choosing the right knot, and even more puzzled when it comes to tying them. Knot tying opens a whole world of connections. On Monday we will be putting the bow strings and bridle strings on the upper elementary school student's kites. All should know how to tie basic knots, so perhaps the lessons learned by the younger students will be passed on. In fact, the lower elementary school students will be teaching knot tying to the older students at the spring camp out, using the supplies you see in the photo. The ropes were supplied by a parent who works in the zip line industry. For safety, the ropes used for zip lining must be periodically replaced and either discarded or put to less strenuous use. The problem with teaching knots and knot tying is that a close view is necessary to see what is happening in a very small space between the fingers. Knot tying using string is hard to demonstrate to a whole class so the big ropes are a good idea, and with the children teaching knot tying to each other, each will receive individual practice and instruction. There's no better way to learn and learn well than to teach what you are learning to another. You might wonder what children in schools should be learning? Of course reading and math are important. But so are other skills pertaining to the real world. 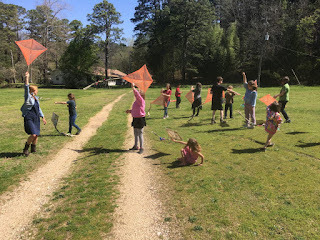 Friedrich Froebel, prior to inventing Kindergarten, engaged his students in making nets tied from string, which were then used in nature study to capture fish and small birds for close examination. In Finnish Schools in the 19th and early 20th centuries, students made lace that is still shown to special guests in a museum at the University of Helsinki. Yesterday I assembled 30 small drawers to fit 6 small 5 drawer jewelry chests. Make, fix, create assist others in learning lifewise. Today a class in beginning woodworking with Steve Palmer begins at the Eureka Springs School of the Arts. I am working on the last photo for my box guitar article in Woodcraft magazine. The art director and editor wanted a photo showing some of the less common tools and supplies necessary to complete the project. From the top clockwise and centered around the fret marking template and fret saw, are tuners, fret wire in 8 in. lengths, small files for fitting strings over the bridge and nut, and the shop made 1/8 in. chisel I used to fit the nut into the neck. There are days in which I have little to say, having already said the same things time and again about education: that it is necessary to have education hands on to have the greatest lasting effect. While I was in Hot Springs to make a presentation to the Hot Springs Village Woodworking Club, our upper elementary school and middle school students were there also. Their reasons for the trip were to study geology (among other things, and they found lots and lots of quartz crystals for which the area is known. They and their teachers are off today in recovery. Each student will have a collection of beautiful crystals they will have pocketed from their adventure. Reshaping education to fit the hands and to thereby better fit the minds of our kids is no easy task. But the idea is rock solid, in that children who have learned by doing real things are better equipped to take on the challenges of real life. Wood shop is an excellent way to introduce reality into a child's education. It may take all of us, an army of volunteers, perhaps, to assure that children have the opportunity to make beautiful and lasting expressions of learning and growth. Make, fix and create.... Insist that others have the opportunity to learn lifewise. I introduced another unit in making superhero because we have new students who had not done it yet. That was fine with my students who had done them before. They had plenty of other work to do, including cats. The toys made by first grade students are joyfully expressive. I did a presentation for the Hot Springs Village Woodworking Club last night and will be on my way home to Eureka Springs this morning. It was interesting last night, talking with the director of the wood shop from the University of Arkansas, Little Rock. For those students who grew up with digital devices, many lack basic skills in the use of scissors, hammers and saws. And so things that we might think simple and easy, are not as simple and easy as they once were, and it is a mistake to expect basic skills to be present in students as old as college age. So, this brings use to woodworking in elementary school. It is important that children's creative capacity of mind is reinforced by creativity in hand. Unattended, both can be lost. Today, after class with my first through 3rd grade students, I head for Hot Springs to give a presentation to the Hot Springs Village woodworking club. This weekend Steve Palmer is teaching basic woodworking at ESSA and there are still openings in the class. To sign up you can go online essa-art.org, or just call 479-981-1416. The class size is small, and safe operation of various power tools is a focus of the class. A beginning woodworker can take this 3 day class (starting Friday) and go home with lovely useful things he or she has made along with new skill and greater confidence. Your participation will support the Eureka Springs School of the Arts. After I've cut the wheels to thickness from round stock, my students at all ages can drill the axle holes themselves using a drill press. We use a lathe chuck mounted on the drill press table to drill at the centers of the wheel, but I'm also working on a self-centering marker for finding the centers of wheel blanks that will allow students, parents, grandparents, and teachers to make wheels from round stock. 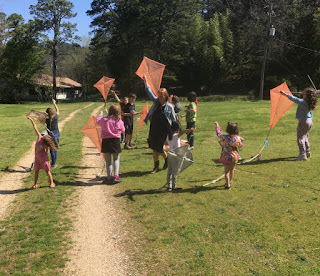 Yesterday in lieu of wood shop, I worked with my lower elementary school class to get bow strings and bridle strings attached to their kites. I reminded them, "these are made of paper, so be careful with them." Needless to say, after running around the playground with the kites in tow, some repairs will be necessary. 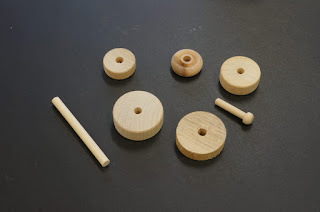 I got in a supply of factory made wheels to show what's available to those schools, parents, and teachers who do not have the means or inclination to make wheels themselves. I am afraid fancy wheels will spoil my kids, making them less loving of the wheels they can make themselves. If my students see something they like, they want to make it. So I get to play in the shop to come up with ideas that may inspire student work. 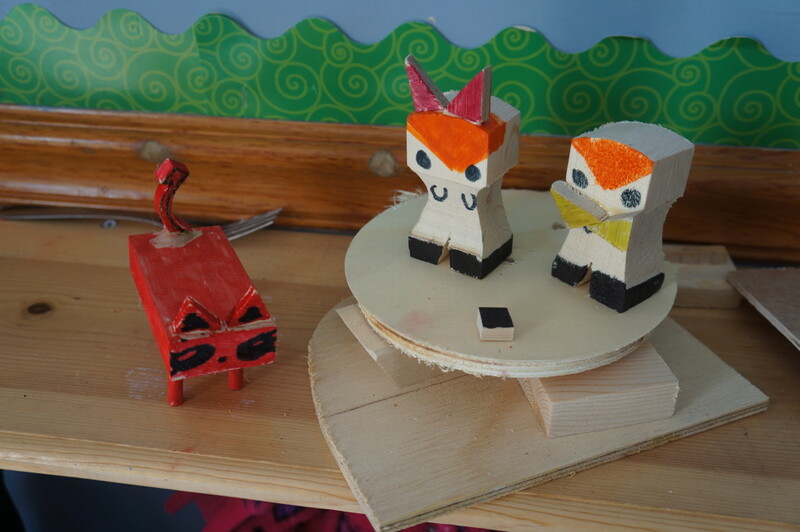 Box making and toy animals are favorite activities, and so to combine the two seems like a reasonable thing. The picture is a prototype or "model," intended to spark student work, and what they do is usually better by their own assessment than my own. Models are also useful in helping the teacher anticipate the tools and materials that students will need in wood shop. The Los Angeles County Museum of Art is creating an exhibit on the impact of Scandinavian design, and contacted me in search of Sloyd models from the history of Educational Sloyd in the US. Unfortunately, neither they nor I know of any actual models remaining from the earlier days. But the exhibit will present some information on Educational Sloyd and they've promised to use some of my published work as a resource in the process. 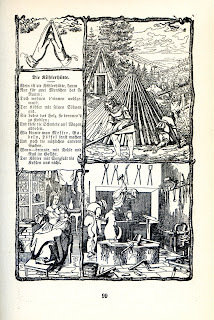 Toy making was not a thing done in the school at Nääs, but was featured in the elementary schools in Finland and Sweden. I am reviewing the layout for an article in Woodcraft Magazine about making a box guitar and learned that they need one more photo that I'll take today. I have been in the process of reviewing student projects and some of the photos can be pretty dramatic. This week the upper elementary school students and middle school students from Clear Spring School are going to Hot Springs, Arkansas on a school trip. One of their activities will be to use the tools they made in woodshop to dig for quartz crystals. I will be also be going to Hot Springs later in the week to make a presentation to the local woodworking group. I will be selling books, showing pictures of my work and encouraging others to take a hand in the useful education of our kids. Yesterday we had wood carving club at ESSA with some new carvers trying their hands at it. There was an interesting discussion about what happens in trees during the winter months. Are they completely dormant or are other things happening within? https://www.ncbi.nlm.nih.gov/pubmed/17737985 Part of the discussion involved the formation of rings and the difference between northern grown bass wood and what we have here in the south with regard to its carving properties. One thing that happens in wood is that as a season of growth ends, some of the minerals from the sapwood are passed into the areas of earlier growth forming heartwood which is darker in color and more dense. It may be that the colder northern climate increases this effect. I spent part of the time building tool storage shelves in the ESSA wood shop closet and putting things in new places. Last night I attended the Clear Spring Fling, which is a benefit art auction to support the school. The amount of effort that goes into it is enormous. The artists and local merchants give generously, The food is phenomenal, and the money raised by benefactors is essential to the operations of Clear Spring School. Last night, one of the school's founders shared her father's points about the value of independent schools. One is that public schools are made better by the presence of a good private school. Another is that private schools are the laboratory of innovation. One that was not mentioned is that private schools are dependent on community engagement. Unlike public schools supported by the mechanism of the state that extracts school funding in the form of taxes, allowing public schools to go on with or without community involvement, you will find private school parents deeply involved. Last night's art auction was a good example, and community engagement leading up to last night's culmination has gone on for months. 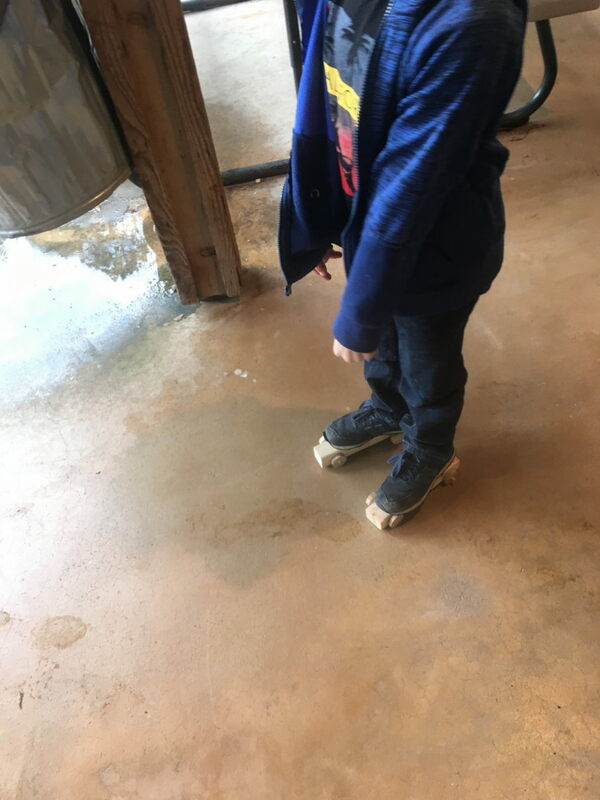 While public schools have to search backpacks, and establish defensive perimeters, very small private schools like the Clear Spring School offer a different example in which the school becomes an extension of family life. You will see this in the school parking lot each afternoon at the close of school. Parents enjoy talking with each other and planning social things together, while their kids continue to play past the school hours, rather than being loaded into buses as is the case in our local public school. Yesterday a reader suggested that volunteers might be brought into schools to assist in hands-on learning. I can not think of a better idea, or one more unlikely to be adopted by schools that have been hardened to repel gun violence. We need a cultural sea change... one in which teachers are regarded with respect, children are recognized as the precious resource they truly are, in which students are safe both in and out of school, in which schools become an extension of community and family life with few barriers between, and in which the rights of life, liberty, due process and the pursuit of happiness are protected equally for all. With all that said, there are four simple changes that we should consider. 1. Reduce class sizes. There is strong statistical evidence that size matters. 2. Reduce poverty. The amount of time that young people spend in poverty has direct measurable adverse effect on their educational success. The third thing is to support Hippy reading ( https://www.hippyusa.org/ ) to launch an army of young mothers in reading to their kids. And last but far from least, make all learning hands-on, planned according to the principles of Educational Sloyd. 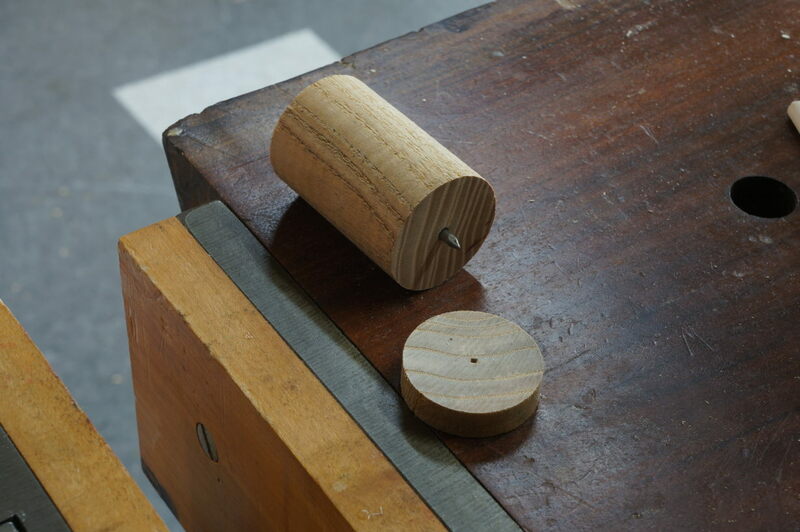 The photo shows a simple new way to sharpen a dowel to form the stem of a top. Put the dowel in an electric drill and use a common block plane to sharpen the spinning tip. 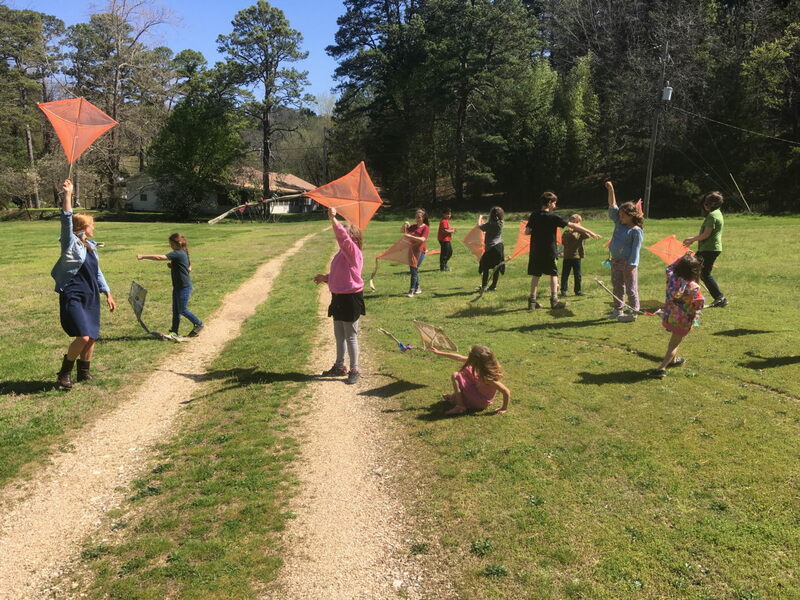 Yesterday at the Clear Spring School my students, grades 4-6 worked on kites. They had asked to work together in pairs, and that helped. My instructions delivered earlier in the week were not remembered exactly, even though they had used their own hands to help the younger kids make traditional paper kites. We arrived at the point where bow strings and bridle strings are to be added. 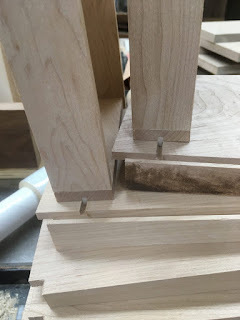 I have been working toward being able to share some of the methods I use to prepare stock for woodworking with kids, and to simplify things that might be difficult for others to do. How doe one drill holes in wheels at exact center? What you see in the photo is a simple device that can be used to mark the center of a large dowel of equal size. Drill a hole for a nail at the center of a large dowel and use that nail to mark the center of a wooden disk of equal size. The nail is loose enojgh in the hole that it can slide when struck by a hammer. With the center marked, drilling an axle hole at the dead center is easy. Use a brad pointed bit in the drill press for best results. To make the marking device, I used the lathe to turn the wooden piece and a drill chuck and appropriate sized bit mounted in the tail stock. My students had been invited to design kites. What I learned was that they had few of the resources necessary to actually design their own. Some of those resources would have been: An understanding of aerodynamics. An understanding of how to get good performance from a pair of scissors. (The material needs to be held tight.) An understanding of structure. The ability to tie necessary knots. An understanding of the materials available and of the required strength of various parts. It was useful to offer them the design of a traditional paper kite as a starting point. To become a designer, one must first become a relentless, irrepressible observer of all things. That may require a starting point in the direct analysis of all things, even those things that are on the surface, too simple for words. Kite making was a project that met the interests of each and every child. and from the concrete to the abstract. Now when the students design their own kites, they will have a better starting point. These principles were shared by Diesterweg with Froebel, then by Froebel with Cygnaeus, and then by Cygnaeus with Salomon's Educational Sloyd. I share them with you. Whatever you teach or learn moves in the same sequence. Make, fix, create, and adjust schooling so we each learn lifewise. 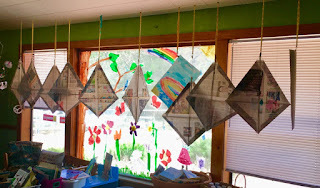 The photo shows first, second and third grade kites hanging for the glue to dry. Next week we will add bow strings, bridle strings, flying strings and tails and then run with them to see if they fly. Today my 4th, 5th and 6th grade students will make slightly larger kites. I've prepared sticks and am offering large orange trash bags to form the skin. Some of my students have come up with their own plans for kites that they can test using materials I provide. On Wednesday we had 7 students grades 1-3 making kites and 7 students grades 4-6 assisting. Today 3 student returned from being absent. After they finished their kits, that left the classroom full. Fortunately, the students put their name on the kites so they can be taken to the next level. Imagine that we did this simple exercise with as any as 30 students in the class. Preparing the materials for each student to make his or her own kite would have been a larger task. Even with the older kids to help and with only 10 kites being made the challenge was real. Research has proven that smaller class sizes bring better educational outcomes. But school is often more about student management than about student learning. If we put student learning first, we would reduce class sizes, train more teachers to teach and insist that lessons be presented hands-on, doing real things. Music, the arts, scientific experimentation, field trips, travel school, camping, woodworking, outdoor studies, internships, service learning come to mind. Those are offered at the Clear Spring School. Smaller class sizes allow for teachers to better know the needs of each student and customize instruction to meet the needs of each and every child. This is something that every politician and school administrator should know: Smaller class sizes and hands-on learning together make better learning. You can cheap out if you like. The consequences of going on as we haven with large classes and students required to sit passively while lessons are delivered are students who are disengaged, and teachers who are overwhelmed. Together those lead to failed education. In the meantime, president Trump is jumping into a trade war with China. A problem we all face is that of being overloaded with cheap plastic stuff that pollutes the planet and removes the incentive for making beautiful and lasting things ourselves. That was the same situation that the Scandinavians faced in the mid 1800s. Cheap imports were flooding the marketplace and destroying the incentive for Scandinavian people to exercise and develop craftsmanship on their own behalf. Unfortunately, our nation is obsessed with the question, where can I buy this cheap? Perhaps we would be just as happy without so much cheap stuff and could begin learning to make for ourselves. 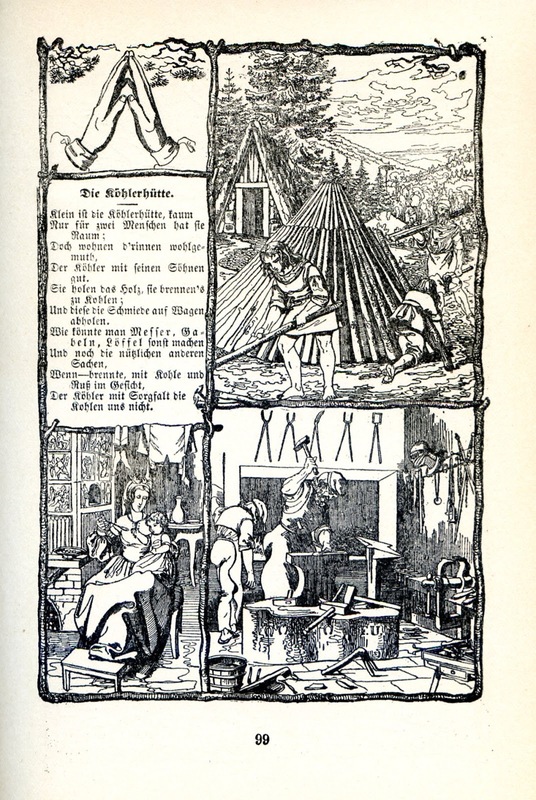 In the Scandinavian countries in the mid 1800's the leaders in both the Lutheran Church and the governments began to understand the relationship between the exercise of craftsmanship and the intelligence and character of the people. We all need to be engaged in making beautiful and useful things. I received a comment from a reader who teaches hands-on science, and feels overwhelmed by having 30 students per class and a total of 135 students under his teaching responsibility. What can I say to help? The following is my attempt. Administrators rarely know that hands-on learning requires smaller class sizes to be most effective. So the question becomes how do you make the best of a difficult situation. You may find the principles of Educational Sloyd to be helpful. Those are: Start with the interests of the child. Move from the easy to the more difficult, from the known to the unknown, from the simple to the complex, and from the concrete to the abstract. Kids these days have been sheltered from the kinds of things I did as a kid. While their fingers are busy sliding over glass, mine were tying knots, using scissors, sawing wood, building stuff with blocks and with clay, so I started with a base level of hand skill that some students will not have. The good thing is that kids who have had much time in school will be ready for the refreshment that the hands provide. So ask yourself these questions: What would be easy for my kids to do? The hard stuff can come later. What do my kids know? And What do my kids know how to do? Use those things as your platform from which to build, even if it requires you to start over with scissors and string. Ask yourself, how can I simplify this project? You know that most things are overly complex, and deserve simplification. Complexity can come later. And how can I build this lesson in the concrete so it serves as a launching point for the abstract? Have some examples ready to show in concrete form what you hope to accomplish. Don 't mistake pictures of something for the concrete or the real. They are abstractions. When in doubt, simplify. That is my favorite rule in woodworking. If your projects are overly complex, that will add additional complication to lessons delivered under less than ideal circumstances. The reader asked how to measure the results of his teaching efforts. That’s a hard one. I watch first for student engagement. Are they engaged in the lesson and at what level, and if not, I ask why… It may be that I’ve forgotten to take the principles of Educational Sloyd described above into consideration. I figure that if they are engaged, then they are learning at the level that's most comfortable to them, as learning is one of the most natural of all human functions. Kids look for learning and hope for it and are happy when learning just as you and I are. If you are a scientist, act like one and explain what a scientist does. Admit and accept the fact that some lessons don’t work out as planned, just as life almost never does. Be sincere, be caring, for the student, their successes and failures as well as your own. Those qualities of character that you no doubt model are possibly the most important lessons your students will learn from their time in your class. Be sure to ask your students what they have learned. Have them write it down so that you will remember some of the best when you have rough days as all teachers have rough days. The lessons of Wissenshaft and the lessons of Kentniss are not measured in the same way or learned in the same way, but they do reinforce each other. Research has shown that lessons in science that have a hands-on component are remembered longer and to greater lasting effect. Standardized test scores are raised more by the depth of a child’s learning than by its breadth, so some educators have been surprised by the results. I can explain why this is true. A brain immersed in the examination of reality is better equipped to discern fact from fiction and be led to the right answer on a standardized test. Yesterday we combined 1st through 6th grade students in making paper kites. None of the students had made kites before. The youngest were paired with the older kids. Making a kite is a relatively simple thing, but requires the use of scissors, string, paper and some development of skill. It is also a science project in which they will test their results and learn from the process. 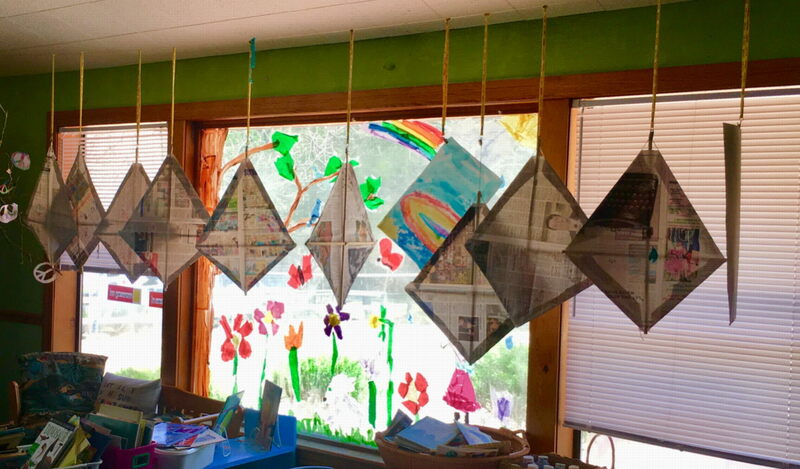 All the kites are now hung in the window of the first through 3rd grade classroom. My middle school students will face a dilemma today. They asked for the opportunity to make bird houses. I acquired 5 1/2 in. wide western cedar for the project. A good source is to purchase dog-eared fence slats from Home Depot or Lowes. A single 6 ft. board is enough to build one house. 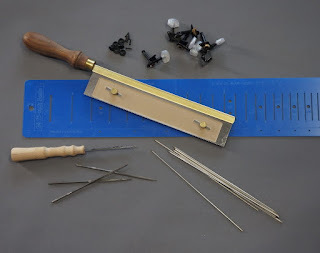 My students' dilemma is that I can make it difficult for them by offering the opportunity to practice their use of hand tools, or I can make it easy for them by making use of power tools and giving them little more actual experience than that of nailing boards together. The question, however, is not just a matter of easy or hard, or how much or how little they want to invest in the project, or how quickly they want to get done with it and move on to other things, but about how much they want to learn, and how much they want to express. Expression can come in the form of creativity, craftsmanship, or both. So, this morning, before we begin work, we'll talk. The photo is from 2007. My high school boys have been busy crafting knives of their own design. The small walnut handled whittling knife is one of the finer examples. The blade shape and handle design were modeled after a small whittling knife I've used for years. Now, one student is making a chisel, so others want to join that, too. Today I am working in my own shop some, then helping students at school with hydroponic gardening improvisation, and preparing materials for making birdhouses on Wednesday. Make, fix, and create, thereby assisting others in learning likewise. The discovery of the Interstitium, a newly named organ within the body that surrounds and cushions the other organs, offers an analogy for the workings of human consciousness. The name for the new organ, Interstitium, comes from Latin, meaning interval. In the human body, seeing the interstitium has only recently been made possible by new imaging techniques that have revealed a structure of colloidal tissue that turns to mush under more direct observation. We think of the space between us a empty, but instead, it is structured by patterns. Those patterns are the creations of ourselves and others, and they directly impact behavior. In the conscious space between us, that we cannot easily see the structures between us does not suggest that they do not exist. Again, I go to Froebel, and his view of holistic reality. He wanted to lead children toward a holistic view and understanding of themselves, which required them to be led to understand the patterns of nature, of culture, of community and discover themselves as meaningful parts integrated within a much larger whole. Froebel had gained his own holistic view through the study of mineralogy, forestry and architecture, as well as by observing German mothers at play with their kids. When I was in college, I started out in Political Science, and then began working toward a double major in Sociology. 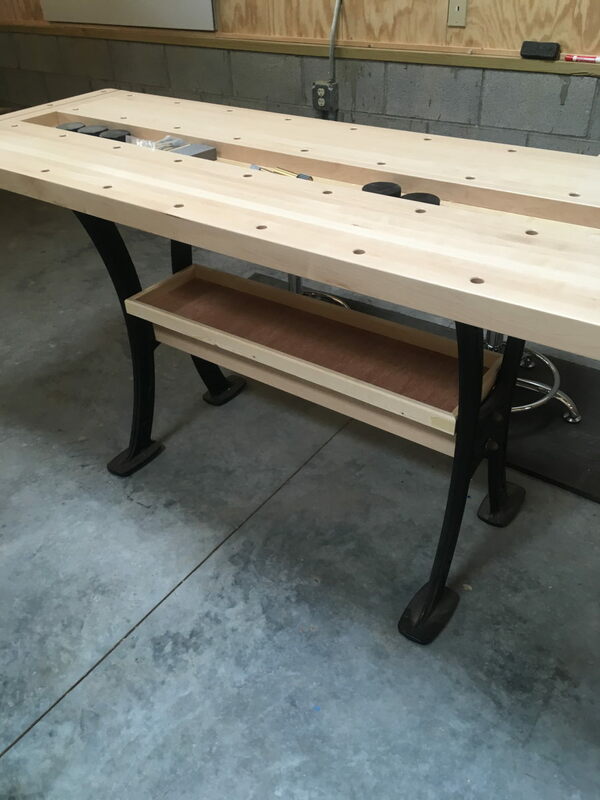 At this point, after many years as a woodworker, and teacher of woodworking, I find myself going back to what had interested me, but at a deeper level. Sociology is intended to explore the patterns in the spaces between us. Let us do that. Today in wood shop at the Clear Spring School, I'll have my high school students, lower and upper elementary and will likely be worn out at the end of it. 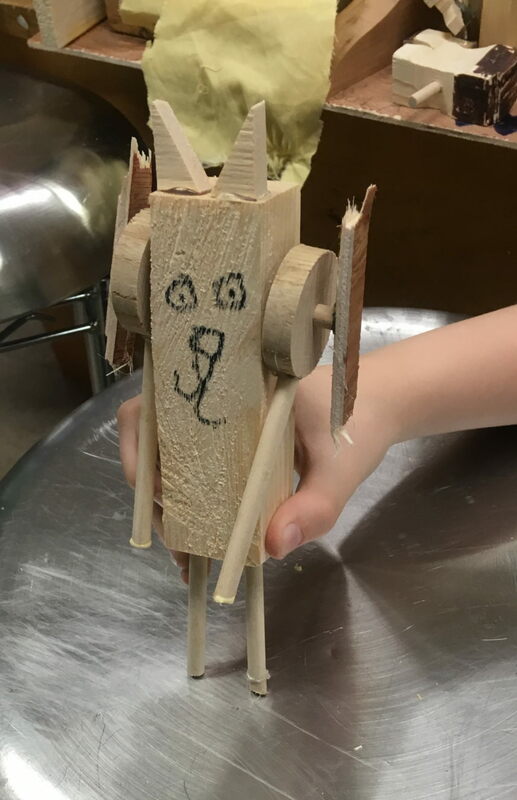 The photo is of a robot cat made last week in the Clear Spring School wood shop. Yesterday I added small tool storage trays to the work benches at ESSA. This exercise was part of my plan to prepare the woodworking classrooms at ESSA for summer classes. The trays lift out for cleaning and will give an off the floor place to put tools, supplies and small parts. Yesterday, also, I listened to a report about what some are describing as a newly discovered organ in the human body. It consists of a latticework of collagens between the other organs of the body. It is thought to cushion the various organs, and to serve as a conduit between the vascular system and the lymphatic system. Some say it is not actually an organ, but it deserves intense examination and research because it appears to offer the pathway through which cancers are spread. The name they've given to this organ is the interstitium (pronounced inter-STISH-um). In any case, whether the interstitium is an organ or not, it is fascinating that we are still learning about the human body, and that researchers had failed up to this point to give such a thorough examination to the spaces between things. I find it fascinating that once one thing is discovered, we tend to use it to pry open the door to understand other things. We do this through the use of the human power of metaphor, using one thing to describe another. That power is exercised at a very early age when children are trying to make sense of language, and begin nothing the similarity between various things. In several states, teachers are having to fight for their rights against repressive budgets that have cut funding to the quick. Arkansas' neighbors, Kansas, Oklahoma, and Kentucky have been hit hard by the idea that by cutting, cutting and cutting taxes, businesses will thrive and the economy will grow, thus, raising tax revenue. Perhaps they also believe in pixies. At some point, I hope we begin to acknowledge the importance of the role that teachers play and make certain they are trained and empowered to fulfill that role. We must recognize the important purpose of education that state policy makers ignore. Schooling must create a sense of citizenship and recognize as its primary goal, that children know how to get along with each other. Let's call that interstitial consciousness. It offers insight into how children get along with each other, sharing either joy, or something worse. If you would like to see joy, plan a visit to the Clear Spring School, at 10:15 AM or 12:15 PM when the students grades 1-12 are at play. Make, fix, create, and enable others to learn lifewise.